Sometimes it is good to have some space from your significant other. No matter how well you get along with your partner, its good to get some fresh air. After a long talk, my bike and I have parted company for Christmas. I am in Wales. It is so nice to be back in a country where my native tongue is spoken. I am chilling with Louisa and her family. All I have to contend with are enormous meals, some tricky accents, lots of tempting alcoholic drinks, and Wii controlers flying across rooms. It sure a nice contrast from the daily uncertainy of the journey and the cold wet and windy roads of Rotterdam. Rotterdam? What the heck am I doing in Rotterdam? Yesterday, after departing from Oosterhout, navigating onwards from Breda, successfully collecting my new passport in the Hague, launching new website updates, and then catching the tram towards my ferry, I sat back and thought smugly to myself: "Russell, you're The Man. You are good! What an amazing traveler you are! This is just too easy." I remember thinking and feeling something similar in my second week living in Costa Rica. The next day I was abruptly fired from my job and set on the streets not knowing the language or having any place to go. My tram pulled up at the connecting bus station. I waited for half an hour before thinking of checking the schedule of the bus that would take me to the night ferry that would cross to England. I checked. The bus line had just stopped running for the evening!!!!!!!!!!!!!!! I then experienced a feeling I haven't felt in a while: Cataclysmic Panic. The only other way to get to the ferry was to head all back the way I had come,and catch two connecting trains. I had given myself lots of time. There was still hope. My heart was beating fast, I couldn't believe it was happening. Now, Panic is not the best state to be traveling in. You tend to attract disaster. Aye... Not one, but two trains broke down on me. I missed my first connection. Then, the second broke down in Rotterdam and everyone had to get out. I couldn't believe it. Things had been going so good! Rotterdam was windy, cold and rainy. I had to find shelter under an awning to crack open my laptop and do some emergency calls and searches. The sleet picked up. It was 12:30 AM now. If you think I was stressed-- imagine Louisa who had helped arranged my travel and who was expecting me in the next day! Long story short. I found a hostel. They even gave me a discount and a beer on the house. I slept very, very well. So what is the lesson here folks? Well, next time I start to think I am an amazing traveler, I will immediately slap myself in the face. I will then put myself on Amber alert. The feeling seems to be the precusor for disaster. Its is as if the universe feels obligated to teach me some humility. Of course, my Costa Rican "disaster" was also the precusor of an amazing three years in the country. It thrust me fast and furious into interactions that formed the foundation of my time there and the most amazing and life changing experiences. Hey... is that a For Rent sign on the apartment across the street? 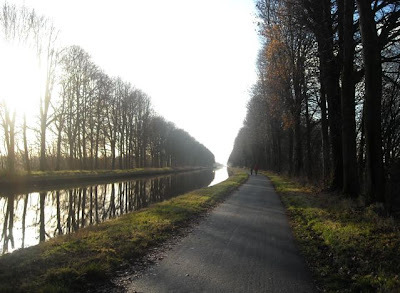 This morning, as dawn broke, I cruised down the smooth cycle paths of Osterhout, Holland. Viva la Vida, played in all its splendor on my iPod. The moon hung like a silver shard in the turquoise sky. Its half darkness a reminder that our moments are inexorably immersed in luminous cycles. Of light, of darkness, of loneliness, of love. A lad from London pointed this out to me on the train the other day-- the philosophical connotation that is. In that sense, we're all cyclists. Its one moment to the next, with our life patterns undalating waves that cycle us from people and places and situations. With each new moment we spiral a tad higher. Perhaps we revisit a similar place on our pattern, but its always from another vantage. Through honesty with ourselves and others, slowly but surely, we remember who we are. Of course, every once in a while, the gentle spiral slips into a cascading revelational rollercoaster. Then things get interesting. And intense. And fun. And very special. What an crazy and amazing time I have had here in Holland. I stopped my bike on an Oosterhout bridge. Underneath, the cars zoomed by in each direction. In the highway-side canals, the now lilac morning sky reflected in the still water. I breathed deeply. A flock of birds crossed the horizon. I am constantly amazed at where the flow of my journey takes me. Today, I stopped on a busy bridge, surrounded by embassys and the ornate archtecture of the hague's diplomatic core. Underneath my feet the water was perfectly still-- the buildings reflected in its dark gaze. I've made a pilgramage to the Canadian embassy here to replace my passport stolen passport. The last few days I've been swept away in a roaring rush of interpersonal revelations. Its been pretty crazy. I have written hundreds of words that I've typed over the last three days as I have been confronted by one situation after another. All in the small, quaint town of Oosterhaut. Who would have thought? I was supposed to be taking it easy here! Today, ironically, making my way to the busy diplomatic nexus of the Hague, has been one of the most languid and relaxing days for a while! Honesty. Its a simple word. But so is gun powder a simple substance! Honesty can take you to explosive places where life takes on a fiery intensity. But also meaning. And colour. As we all known, fireworks and their vibrant explosions of cascading colour, can be quite sublime and beautiful. I've been striving to follow Honesty's harrowing path. What a ride. Next: the 3 AM writings! My friend Jarrett, told me a story about how he took his peace portrait for my 1Mandala project. Apparently, he waited for several weeks til he felt just the right combination of joy and peace. When he hit it, he called his quickly called to his partner "Quick get the camera! I am ready!" They scrambled around and found the camera and he beamed out some great vibes. I have had a glimpse of the beautiful workings of the universe and how it is bringing me, and others, the experiences we need to heal and grow. Things that I thought could only be bad, have somehow twisted and transformed into blessings and deep connections. Its as if, I've come out a long shaded valley and risen to the crest of a green hill. From my perch I can see ahead and behind-- the path does indeed run straight and true! The forest was not dark, but rather cool and refreshing. I knew it all along, but somehow nearly forgot. Fortunately, unlike Jarrett, I have a built in webcam on my laptop! Listening to a nice song, it hit me that I too had some great vibes to shares. That's my peace portrait. Oh yes... I am a visual artist... not a writer! Given the epic essays I've been typing of late, you might think I had forgot! Here's a photographic piece that was composed one day wandering the streets of Brussels in a flu filled daze. 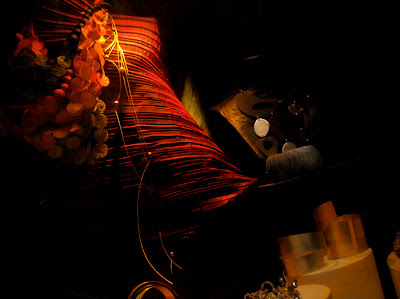 I came across a Jewlery store window filled with lush textures, intriguing forms and rich colours. I was captivated by the sensual reds. Perfect setup for a little abstract composition. 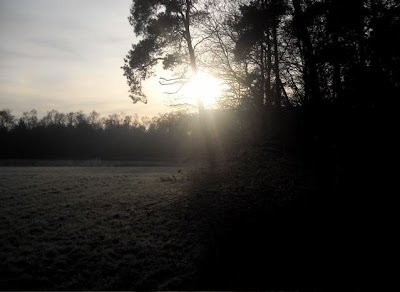 From dark to light: A frosty field Dutch field is illuminated by the first light of dawn. My first day in Holland. This morning, at long last, I rolled into Holland. I sit in a cafe in the heart of the ornate city centre of Breda. The cathedral looms above me as the first morning shoppers stroll through the tightly packed streets of shops and cafes. The church bells ring as I type. My French press coffee is ready. With not a little relief, I press it down. I am 10 kms from Oosterhaut, Holland. My arrival there is a bit of a landmark in my journey. Way back in Pittsburgh, in the midst of a hot and humid summer day, I met a Dutch woman on a bustling city bus. Two travelers sharing the same seat in a sea of locals. It was a most dazzlingly unlikely place to meet another traveler. Something resonated. We strolled through the streets together and she invited me to pass through her little town in Holland when I reached Europe. I said I would-- not really beleiving that one day I would actually feel the Dutch air on my face, wipe the morning frost on my tent, and caress the smooth bike paths of Holland with my tires. As my journey has progressed and my scheduling and geographic expectations have melted into futility, this is one destination that has stuck. 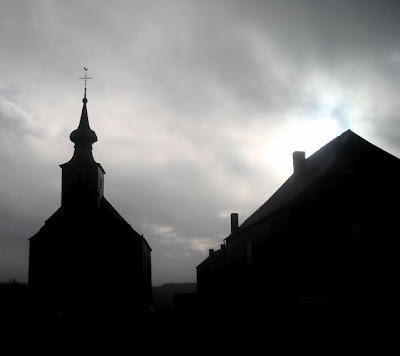 And so, this afternoon, rather triumphantly, I will ride into Oosterhaut, Netherlands-- a town nobody in Northern Belgium or even here in Breda seems to have heared of. Yet, strangely, it has gathered a nexus of meaning for me. I have a long awaited and emotionally symbolic package with my winter equipment at Abby's address. I also have some profound philosophic and personal realizations about relationships culminating simultaneously. Its great traveling and meeting people. Yet, the act of traveling and not resting long in one place completely reshapes how one engages in relationships. From new friendships to romantic relationships, it is all effected. How can I expect someone to have a 'normal' relationship with me when I am by definition moving on? How can they expect that from me? The definitve brevity of my encounters makes them all that more rich and profound-- and ironically, that much trying to move on from as the road beckons me on. It forces the other and I to be deeply present for the moment of togetherness. This is of course, is a recipe for beautiful experiences. But... Aye. It is challenging. It is rich and intense and fantastic, but at times it is heart rending. At one level I am dazzled by how I have manifested and attracted people and situations exactly as I have conceived them pedalling along on my bike. Experiences to learn about myself in. That's what relationships are all about I beleive-- by getting to know others we get to know ourselves. Of course, its not only I attracting them into my life, but they attracting me into theirs! This goes for the folk who randomly meet me on the road, to people I stay with geographically or in spirit. I gotta admit, I am a bit of a character biking the world like this-- it strikes me that for people to attract me to them, they are manifesting a very unique experience often at a pivotal moment for themselves. Its humbling to play the role. On days like today however, I get a little daunted by the challenge of all these beautiful yet fleeting meetings. I have but one respite-- being in a place of honesty and intuition. Fear and insecurity urges me to turn away and hide things. It is %@&@% tough sometimes, but keeping things clear to myself and others is essential. Lessons can only be read learned when the reading light is turned on! We're all learning something here. My friend friend John Kirby, likes to stop, laugh and say "Its all just a big game Russell... we're hear to remember who we really are, and to do so by living grandly and richly". As we all play the game together, its good to remember that. John was good at laughing. As my foolishness and my wisdom bring me these intense experiences,deeply and dazzlingly intertwining me with others, its good to just laugh at the wonder of it all! So much better to living so richly and intensely-- we have nothing to loose! And of course, we're getting exxxaaactly what we asked for! Hurray! I've made it into Holland. My tires are now crusing the smoothest, most amazingly cycle friendly paths that they have ever touched! Last night, I decided to chill out in the lobby of the hostel, here in Antwerp, where I am staying. I fell into a conversation with a lad from Ireland. After a lengthy discussion on the merits of various sci-fi films I decided that instead of going for a beer at the pub I would retire for the evening. "You know the Belgians at the pub are always open to talking to people. 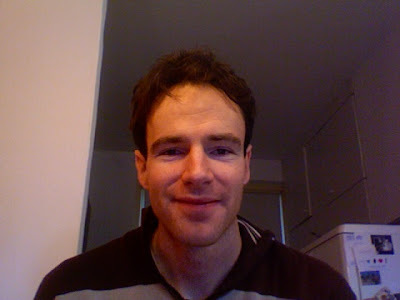 You should really get out and meet some locals before you leave Belgium"
His impression immediately struck me: He thought that I had been holing up in the Hostel during my time in Belgium and hadn't been meeting people! I laughed a little too loudly back at a the poor chap. It him me then, just how blessed I have been in meeting locals. Of course, many backpackers and tourists pass through and hardly meet any locals. It happens all to easy. However, I have met, talked to, stayed in the homes of, walk with, dined with, dozens and dozens of locals-- if not hundreds. I've had tea with Belgians from 4 years old to 90 years old, from the Walon side to the Flemish side, from the city and from the farm, from mentally challenged to univeristy professors. The reason I was decided to stay inside was to recover from my intense "anthropological adventure"-- as the Irish chap put it after hearing a few of my tales. Very soon my journey will lead me on from Belgium into Holland. Wow... I could never in a million years have expected all this stuff to happen to me. In Belgium of all places. Looking back, I am blown away by the kindness and generosity of the Belgians. You wouldn't expect it on first glance. The Belgians seem very preoccupied with their country's crazily divisive cultural and political situation. They are also immersed in living the the Good Life. But give them a chance to be generous, and wow! Look out. On my way in to Antwerp, I asked directions from a lady. Her and her husband were biking in the same direction so they bid me to follow. Then they invited me into their house. Then they invited me to stay the night. Then to a wonderful dinner and conversation! Leaving refreshed and happy, I met another cyclist, only three minutes down the road. He invited me to follow him to the centre of Antwerp. Then he bought me an Antwerpian beer! I have nothing but good things to say about Belgium as I depart this wonderful country. Man... I wonder if the Belgians will even let me leave! I write from Antwerp Belgium. I am cycling through. I am at a little cafe in the downtown area. I am in this city trying to decide whether to stay or not. Here lies a warm bed, comfort and a cool place to visit for a day or two. The road leads to much uncertainty, the unknown and no definite place to stay. If I stay I maintain an illusion of strength. If I go I show weakness and vulnerability. I can't decide which to choose. I've been here at this cafe for an hour now. To stay and wait, or to go onwards? After writing this down the choice is all but existential. This morning, I woke up in a Flanders Forest I may still be in Belgium, but it feels like another land. But its not just geographic. Its existential. I have emerged from the cycling Hell of Brussels and Charleroi to the Gates of Cycling Paradise. Brussels is a cross between an ultra modern and refined European city and a third world capital-- the traffic infrastrure is actually there, but no one respects it. Chaos ensues. I am basically proud to be alive after going right through the centre and out! But, Oh My Goodness. It is beautiful out here in Flanders. 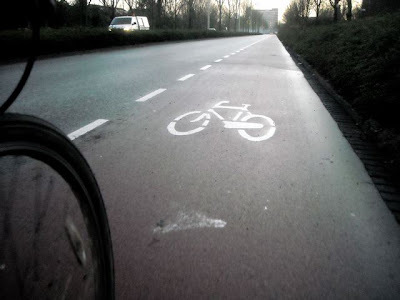 There isn't just a one cycling lane on the sides of the roads. There's one on each side! They are specially paved and marked. And there's not just one on the main road. They are on every road! Little old ladies, men on their way to work, and in particular noticed all sorts of beautiful women cycling around. Its amazing! Not to mention, that everywhere there are open WIFI networks. Cycling paths, beautiful cyclists, good coffee and WIFI. Apparently, this is just the Gateway though... Holland is supposed to be even more cycle friendly! While passing through Landrecies in Northern France, a family invited me to camp on their lawn. They also invited me in to their home for cofee and conversation. Their seven year old daughter and I started drawing. I showed her how to make a mandala. She caught on to the principles of symetry and reflection immediately. It was pretty cool to watch. Above is her mandala! In the end, the whole family gathered around the table to help her and I colour it out. Alright, this entry might get a little philosophical and tad lengthy. I have been thinking much about Mandalas lately and need a place to put my thoughts to words. When I first began working and researching mandalas, I read how: (spoken in a deep narrator's voice) "mandalas are an ancient spiritual tool with great power for healing and self-discovery". Sure, sure, I thought. Just some more New Age superlatives and fancy-dancy terminology. Nonetheless, in my two years experimenting with mandalas, I cannot help but be deeply intrigued by their power. Last week I made a mandala out of some leaves. It took an hour kneeling on the ground to compose. Yet, after putting it on my blog, that hour and that little creation, made all sorts of ripples. Now, we're not talking tsunamis, nor even waves here, were talking tiny little ripples! A friend used it for a birthday card cover, another for the cover of art publication, and another was inspired to make her own leaf patterns. I received several comments on my blog and who know what else. It was a simple picture, but it seemed to have a subtle and compelling effect. Subtle is an important word here. Mandalas don't make a big splash, they simply have a subtle yet inexorable effect. The natural balance and geometry that one is compelled to follow when making them, helps focus and intensify one's intentions. One cannot help but become focused, indeed meditative, when drawing, building or creating one. When one looks at a mandala, a similar meditative compulsion arises-- although not nearly as strongly as in the process of making one. Its as if the intention put into building a mandala subtly spins off as it as observed by others. But this isn't magic or supernatural stuff. Its the basic principle of intention. Intentions are of course thoughts that are put out and have effects. Intentions can be put out in all sorts of forms-- a book, a clothing design, an essay, a request, a blue print, a blog post! Intentions have effects-- its simply a natural process of how thoughts manifest reality. However, the strength and coherence of intentions is what makes things happen. The focus and strength of an intention determines how far the repercussions of the thought actually go forth. Mandalas, as their geometric and meditative character focuses intention, naturally work their subtle "power" in strengthening and furthering intentions. Now, where things really get interesting, is when you start building mandalas with other people! The Tibetans are famous for their sand mandalas. These are built by several monks working together for days if not weeks. Here, the intentions of many are focused and synchronized. We've all been splashed by the tide when two or three waves happen to fall in sync and splash up twice as far on the beach. 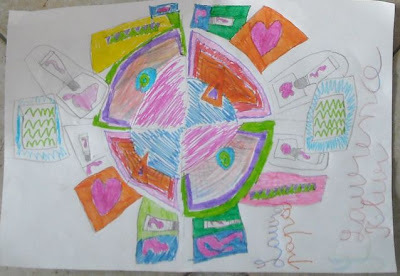 With collaborative mandalas, I beleive the same principle is at work. The harmonizing power of collaborative mandalas magnifies their power exponentially. 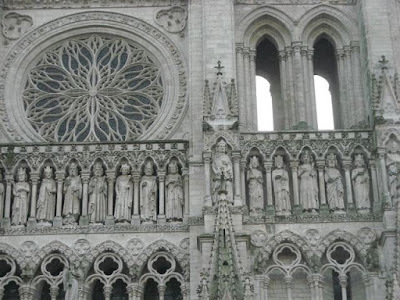 Another great example of collaborative mandalas are the rose windows in cathedrals. I've been greatly appreciating rose windows as I pass through centuries old towns in France and Belgium. Cathedrals and rose windows are everywhere. In many ways they are the crescendo of a cathedral's construction. The structure rises and is built with the rose window as the most distinct and striking element of its design. The design of the rose window distills the whole particular theology of the Church. If the Church is catholic, it will have saints in it, if its patron saint is X, then X will be a focus, etc. The significance of these windows is again subtle yet powerful. In some towns the rose window design was plastered on historical boards, pamphlets and signs. The unique theology of the window manifests and continues to influence how the religious community defines itself historically, in the present and will so future. Standing in the cathedral in Amiens, France it struck me that building a collaborative mandala on the Internet, is in many ways the parrallel of building a medieval cathedral. Eight hundreds years ago, the entire community, city and surrounding area, would labour for dozens to hundreds of years to build their cathedral. The edifice that spilled outwards was a grand collaborative effort that manifest the highest technology and spiritual thoughts of the society. When I contemplate all this, I get shivers at thinking of the power of building a grand mandala with people from all over the world. There is some serious power being tapped there.